1. Within the Member Listing, access the Member Detail page by searching for the Primary Member and viewing their profile. 2. Click Subscriptions at the top of the page. 3. 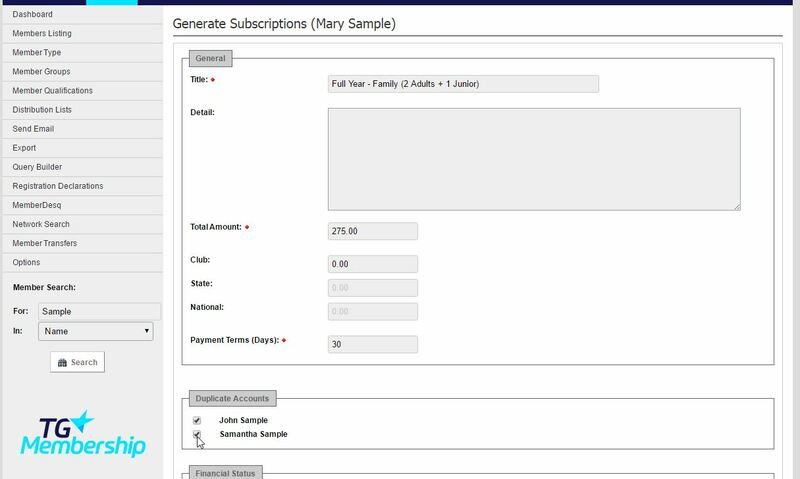 Ensure that the correct Subscription Type is selected and then click Next. This should be the Family or Multiple Membership, not the Member's Default Subscription Type which will be different. 4. Check that the details are correct, and select the linked members that you want to duplicate the payment for, then click Generate. 5. Click Post to create the unpaid transaction, and then Payment. 6. Click the method of payment, and click Submit Payment. This process can be used to create invoices for members by leaving the process after clicking on POST. This will put the transaction in Unpaid Transactions. If a transaction is sitting in unpaid, the member then has the ability to log into the console and make their payment using their credit card.